Joe Wadlington is currently “writing a book about guys who don’t text back,” but he might be better off writing about guys who managed the most horrifically placed chain restaurants in the world. On a recent date, he discovered that his potential paramour used to be the general manager for the Olive Garden restaurant in Times Square, a restaurant that operates much differently than its contemporaries and attracts a much different crowd. He used the date as a means to gather as much information as possible about the restaurant and shared his findings in this Twitter thread. It spans many tweets, but here’s a selection of our favorite revelations. This next one requires some context. 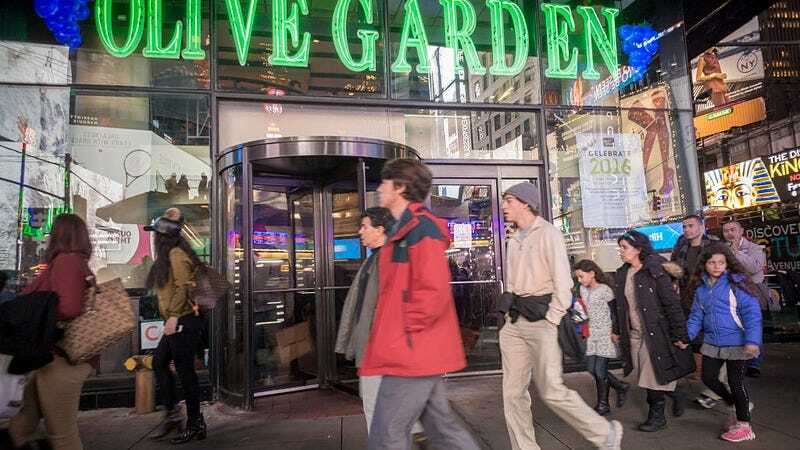 Once upon a time, the Times Square Olive Garden was host to a knife fight. The manager responded by throwing them out onto the street so they could “deal with it out there.” When asked what was worse, a knife fight or running out of breadsticks, Joe’s date had a quick answer. It’s safe to say this was a match made in heaven.